Google's latest Android operating system update, Android 9 Pie, was officially released to customers today following a beta testing period that started earlier this year. Android Pie introduces a new gesture-based system interface that's similar to the interface of the iPhone X, with iPhone-like swipes for navigating through the operating system. We went hands-on with Android Pie earlier this year when it was in a beta testing phase. The new update also introduces the Android Dashboard, designed to tell you how much time you're spending on your device, which is similar to Apple's own Screen Time feature. A new Do Not Disturb option called "Shush" silences Android devices when placed facedown, and a Wind Down option lets Android users select a specific bedtime to turn the interface gray to discourage smartphone usage at night. 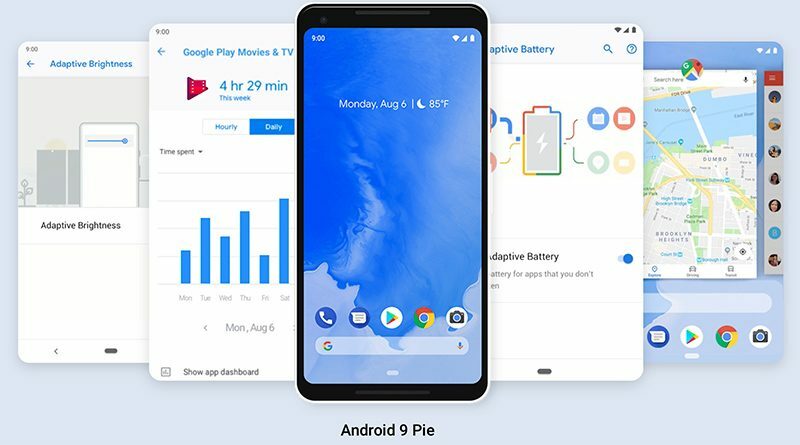 Android Pie also includes an Adaptive Battery feature that maximizes battery power by prioritizing the apps you're most likely to use next, App Actions for predicting what you'll want to do next (much like Siri Suggestions), and Slices, a feature that brings up information from your favorite apps right in search, is coming in the future. Like all new versions of Android, Android Pie is available for a limited number of smartphones at its launch because Android-based smartphones use customized versions of the Android operating system, and each smartphone manufacturer needs to make the new software available to its customers. Android Pie is available to Pixel phones today, with the update set to roll out to recent devices from manufacturers that include Sony Mobile, Xiaomi, Oppo, Vivo, OnePlus, and Essential later this year. 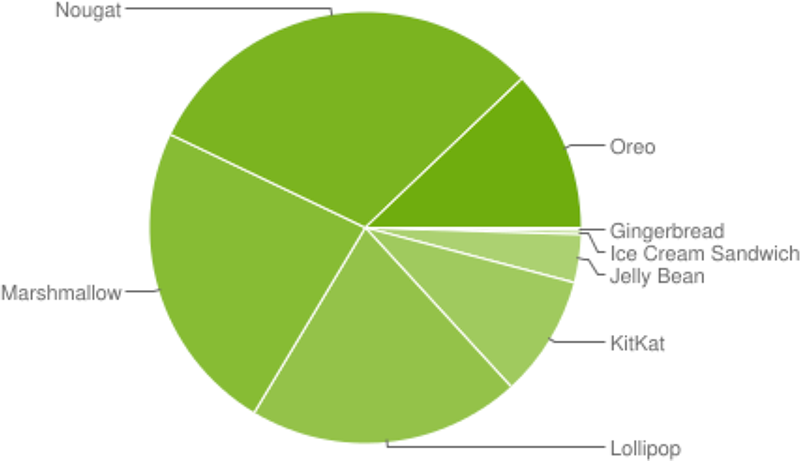 The majority of Android devices are not likely to ever see the Android Pie upgrade given Android smartphone fragmentation. The previous release, Android 8 Oreo, is installed on just 12 percent of Android devices as of July 23, 2018, despite the fact that it was released in August 2017. Most Android smartphones continue to use Android Nougat, Marshmallow, and Lollipop, updates that came out in 2016, 2015, and 2014, respectively. Comparatively, Apple's most recent operating system, iOS 11, was installed on 81 percent of devices as of May 31, 2018. 14 percent of devices use iOS 10, released in 2016, and just five percent of devices use an earlier version of iOS. Apple is able to control the operating system on all of its devices which allows the company to distribute bug fixes, new features, and more to customers much more quickly. When iOS 11 was launched, 25 percent of customers had downloaded it after just one week, and iOS 12, with the wealth of features that it brings like Screen Time and Siri Shortcuts, could see even faster adoption when it's released alongside new iPhones this September. i see what you did there. pie charts everywhere. Internals are frequently upgraded as Android is very modular. It doesn't require a "whole OS" upgrade. So one could technically be running an older build of Android per se, but with latest internals. Pie (sic) because it will be installed on just 3.14% of the user base by year end. Yeah except my mothers phone running Android 5 can still run pretty much any App on Google Play. Can iOS 5 run 90% of the App Store? This whole dig against Android is pointless unless you're obsessed with always having the latest and greatest. Older versions of Android are still good and completely usable. Probably more usable than older versions of iOS. This isn't the reason for such a low install base for Android. The biggest reason is that most of the non-flagship phones see very few future updates. Heck, there are brand new Android phones that will never see Android 9 be able to be installed on them. Once a year Google releases a major Android update. But the issue is that is an update for STOCK Android. For example, my Galaxy s9 is running a Samsung Experience version of Android, which means that Samsung will need to make sure its modified version works well with the updated Android version, so I won't be seeing the update for a couple of months after the release. The same applies to most other manufacturers which have to put quite a bit of effort to make sure their custom android versions function properly. Also, there are a lot of android phones out there, and often upgrading to the latest version of Android is not financially viable for the manufacturers. If you are buying a phone for $300 you don't really care about the Android version and specs too much, you care about the price. And this is a WORLDWIDE chart. If you look at just the top manufacturers like Samsung / Huawei / OnePlus and so on, you will find out their flagship phones - doing apples to apples comparison - are running the current version of Android or are one cycle behind. Will they ever get tired of copying iOS? Look at the left panels, they look a lot like iOS 7. Keep in mind the "current install base" chart is world wide. US installs are MUCH higher. I have 20k users on my app and 64.1% are on Oreo and 26% are on Nougat. One of the main reasons I would not want to go back to android. Imagine owning an S9 stuck in Oreo for the next eight months after P is released. No thank you. Can you imagine every iPhone back to 5S will be getting a speed increase when iOS 12 is released shortly ?